Faster Actuation: With reset and actuation at the exact same point, you rack up more keypresses at an insane speed, maximizing APM during fast-paced games. Light & Clicky: Get the familiar, clicky feedback you love, while enjoying how every keypress is super light and balanced. Truly the best of both worlds. Stabilizer Bar: A key stabilizer bar on the top of the switch ensures keycap motion remains level and consistent no matter which corner of the keycap you press. More Durable: With optical actuation providing less physical contact, you get durability of up to 100 million keystrokes—twice the amount of the industry leading standard. A solid aluminium matte top plate adds increased sturdiness with a smooth, satisfying touch. Unlock advanced options from commands to device lighting effects powered by Razer Chroma™. Features • New Razer Opto-Mechanical Switch™ – Light and Clicky. • Key stabilizer bar for precise, balanced actuation. • Plush leatherette ergonomic wrist rest. • Razer Chroma™ backlighting with underglow. • Multi-function digital dial with three media keys. 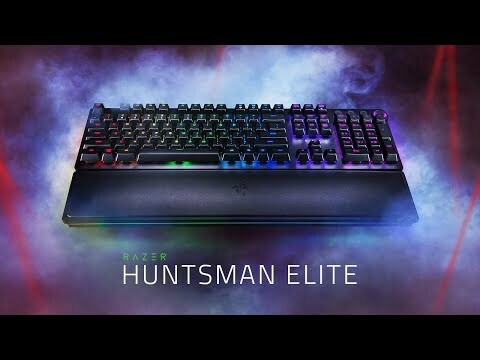 Razer Huntsman Elite Chroma Mechanical Gaming Keyboard, Razer Opto-Switches, RGB, 10 Key Rollover, USB is rated 5.0 out of 5 by 1.